Spatial thinking and geospatial technologies are important for today’s students for a number of reasons. Many problems have significant spatial components or present themselves spatially. Long-term studies of people who have entered careers in the fields of science, technology, engineering, and mathematics (STEM) have shown that these individuals possess strong spatial thinking and problem-solving skills. And geospatial technologies are a very accessible platform for problem-based learning. Spatial thinking cuts across K–12 curricula. So shouldn’t everyone be doing it? Absolutely. However, because it isn’t pegged to a specific area of study, no one discipline is a champion for it. All too often, then, spatial thinking and geospatial technologies don’t get brought into the classroom. In 2005, JMU adjunct professor and Esri K–12 trainer Kathryn Keranen and I developed the Geospatial Semester to help high school seniors reclaim their final semester of school. Instead of enduring the doldrums of those last few weeks before graduation, we envisioned students engaging in a project-based class that would help them get ready for the transition to higher education or work. The class is taught by a teacher at the students’ high school, and JMU faculty make regular visits to mentor the teacher and the students in the use of geospatial technologies. The high school seniors have an oral midterm and give final presentations to JMU faculty, and they can earn JMU credits for the class. Over the years, we’ve seen some first-rate work. Many students have gone on to get internships and jobs in geospatial fields. 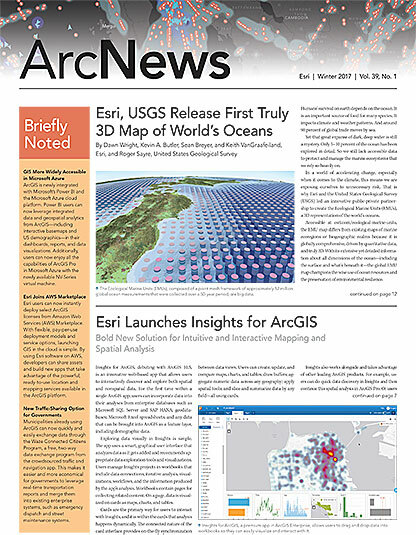 Four of them even presented at the Plenary Session of the 2012 Esri User Conference. As a result of the program, we’ve seen an increase in the number of geographic science majors at JMU—and current enrollment is at an all-time high. Additionally, nearly 3,000 high school seniors have earned JMU credits for the class. Through the decade-plus of the Geospatial Semester, we have seen hundreds of fascinating projects that employ geospatial technologies and feature spatial thinking. We have watched a number of students with special needs use geospatial technologies to help motivate their STEM learning. And we’ve seen students alter their career trajectories toward geospatial fields. That is why we put together a project to carefully analyze what is actually going on. Working with psychology professors Adam Green from Georgetown University and David Uttal from Northwestern University, and with funding from the National Science Foundation, we are looking at what happens to Geospatial Semester students’ spatial thinking skills from the start of the class through its culmination, comparing any changes in behavior or cognitive skills to similar students who are not taking the course. To do this, we are administering spatial thinking tests, assessing students’ projects, and interviewing them. We are also taking a group of students to Georgetown to undergo testing in an fMRI machine so we can get a sense of changes in their brain function. We believe that this is the first time anyone has looked at functional neuroimaging to assess a K–12 curricular change, so we are very excited to see the results. Should we find that the use of geospatial technologies brings about a positive effect, it could have a dramatic influence on the adoption of these tools in the K–12 setting. At long last, we might have the kind of quantitative data that supports the use of geospatial technologies in primary and secondary schools. That is not to say that we won’t still face hurdles. The two greatest challenges to gaining extensive use of geospatial technologies in K–12 schools are high-stakes testing and an overly dense curriculum. We seem to have lost the forest for the trees in K–12 education, so it is difficult to get teachers’ attention. And while there are some very interesting pockets of activity in getting geospatial technologies and education into schools, we have not yet managed to scale them up. The Geospatial Semester was designed so that other universities could adopt it in their service areas. But to date, only Pacific University in Oregon has done the experiment. Robert Kolvoord, PhD, is dean of the College of Integrated Science and Engineering at James Madison University in Harrisonburg, Virginia. He became involved with GIS almost 25 years ago. In 2012, Kolvoord traveled to Ghana as the inaugural instructor in Esri’s Education Ambassador Program, which was formed to introduce GIS to secondary students living in developing countries. Together with Kathryn Keranen, he has also authored the Making Spatial Decisions series, which is available from Esri Press.